I seem to be in a minority here with my rating of this book. It teeters very much in the "MEH" category, but I have to admit that once the show got going, I found enough enjoyment in it to continue reading the rest of the series. At the very least, there's a sense of, "Hmm, what's next?" going on here. The characters weren't relatable; the heroes were flat and unexciting and the villains were kind of comical (I kept envisioning a creepy looking dude with a curling mustache and twirling it while plotting to do evil). The world was developed decently, but not experienced very well; it all sounds well and good on paper, but kind of boring and flat in action. Worse yet was the Healing/Magic system, which I'll get into in detail later. There's too much "black and white" in this story when a lot hinges on gray area concerning Nya, the heroine's own moral dilemma's concerning her powers. The people seem to be set in absolute categories: they're either good or bad, heroes or villains... well, all aside from one particular character, Jeatar. He's just confusing. But, nonetheless, I managed to find it entertaining and progressive. The Shifter had an extremely info-dump-ish and slow start. And yet at the same time, I'm still not sure I understand how the world of The Healing Wars or the magic system works. The healing skills were explained in a very tedious fashion without actually telling you how the whole process works. I mean, it took 75% of the book to acknowledge that pynvium cannot be reused--it becomes pretty much dead rock after it takes in pain and then is used as a weapon to inflict more pain. I spent a lot of time wondering why the healers don't just re-purchase used pynvium to continue unloading pain into; why pynvium was such an expensive, yet rare and valuable resource aside from the obvious. And it took about 50% of the book for me to realize how the healing process MIGHT work, because I'm still not really certain I understand it correctly. Takers are able to heal people by drawing the injured's pain into themselves. Following, they must endure said pain until they can dump that pain into pynvium. Sometimes they are just manifested as aches and sores; other times the pain is so excruciating that it could render a Healer immobile. Then there are Pain Merchants who draw pain into themselves without actually healing people sometimes if they can get away with it--take the pain and make the victims think they've been healed, but leave the injuries that will eventually kill that person... or heal on its own. But where do the injuries go? The broken bones, the bruises, the bleeds, and the crushed organs? Do they just stitch themselves once the pain is gone? Does the healing process in one's body speed up once the pain has been drawn away? But we've already been told that drawing away pain doesn't mean a healed body. What strange magic is this, unexplained, that actually heals the wounded? And then what's the point in having a distinction between Pain Merchants and actual League Healers? Don't they both do the same thing? Because I'd spent a good part of the book thinking that the "real" League Healers also drew the injuries and wounds into themselves as well, relieving victims of their hurts. That maybe the Healers just have a higher tolerance for healing their own bodies and just need to handle it until they can get back to their League home to dump the pain and injuries and wounds into that big pynvium Slab. Except, apparently I thought wrong because the League Healers also only draw pain into themselves while healing their patients at the same time... and so that brings me back to... where do the wounds and injuries go? How does it get healed? And what's the point in Pain Merchants being utter assholes and only drawing away the pain, but leaving the wounds if it doesn't cost them anymore than drawing the pain away would? See... I still don't quite understand how this whole deal works. And don't even get me started on the plausibility of other magics being involved in this book. Nya makes infrequent, yet obviously significant mentions of her father as an enchanter who "tells the pynvium to absorb pain" or something like that, but that set of skills is never explored further aside from passing mentions in flashbacks. There's still a lot of development to be made concerning the magic system in this world that I'm still having a hard time trying to grasp. Either things aren't making any sense or things aren't being presented properly. It's all so vague. The book has its appeal since it does draw those lines between right and wrong using Nya's shifting powers as a base. There's an entire "How can Nya's powers be used for good if it really just causes more pain?" type of scenario. Nya is a Taker like all the rest of the Healers, but she is incapable of dumping her drawn-in pain into pynvium. Instead, she can only dump pain into another person... which defeats the whole purpose of being a Healer, because, apparently, in order to save one person, she'd have to kill someone else since apparently shifting pain has even more dire consequences. So now Nya must continue to figure out her niche in life and how she can be a hero to her people (at the age of fifteen, yo) by using her special, yet deadly powers. She needs to make decisions and depend upon her moral compass to tell her what the lesser of two evils is and when it would actually be justifiable to use her powers. It's an interesting concept that I would like to explore more of. Then I'm reminded that when Healers draw pain from the injured, they go and dump it into pynvium which then gets molded and formed into weapons and sold to people who are intent on war... It still comes full circle: Healing one person, in the end, comes back to hurting others. The pain just travels and never really goes away. Which brings me back to: Where do the wounds and the injuries go? Because we've established that removing the pain doesn't necessarily make the injuries go away. How are people healed? Is it some other special skill or is it something that "just happens" when a Healer draws pain? I'm so confused. If the pain doesn't actually ever go away and circulates the world, how do the injuries and wounds that caused that pain in the first place just disappear? And another thing that bothers me: The people in this world rely entirely too absolutely and heavily on Takers to heal all their injuries (broken bones to bruises) and only once throughout the entire book was the word "salve" used for some superficial scrapes and bruises. I'm not even sure there's any mention anywhere else about using more traditional or common means of treating injuries. Like how you can just wash and bandage up a cut and let your own body heal itself; or putting some soothing ointment (or salve) on scrapes and such and letting those injuries heal on their own. I can understand going to extremes with the less accessible injuries such as internal bleeding, broken bones, and crushed organs. But those have proven to be quite the intense pain for even Healers to be able to handle. But then again, it seems like once they manage to deposit that pain somewhere else, their recovery time is almost immediate. I don't know, it all just feels too convenient for me. It just would make more sense if the Healers also knew how to treat the wounded without relying completely on Takers relieving their patients of all their pain while healing them. I mean, as cliche as this sounds, sometimes enduring pain is how we learn to get stronger. Taking away all the pain as a means of healing would only make people weaker. Maybe I'm wrong, but I'm hoping this issue will be addressed in the coming books. Then again, that's because I still haven't quite comprehended the world and the magic system. Maybe things will make more sense as the series continues, but I have a feeling we'll just focus more on Nya's journey to finding herself while saving the world (at the age of fifteen, yo... and with friends). She's a smart girl, despite the whole, "act before you think" thing, so I'm still intrigued with her. It's just that... The entire story also kind of reads like an overdone, rushed through hero versus evil villain plot. It's very straight forward, very simple, and everything just falls into place that's necessary for our hero to save the world without much backing to her own deductions on how the villains are planning things and making his moves. Everything is just entirely too convenient. There is no questioning of how our heroine knows all of these "facts" that she has deduced on her own without concrete evidence. She says it's happening this way, so it must obviously be right. On top of that, I felt like there was a lot more "telling" in the narration rather than just letting the reader deduct their own opinions. Towards the end, the characters got pretty preachy to the point where I was wondering if the author didn't trust the readers to come up with their own opinions concerning the controversies and philosophies in the story. 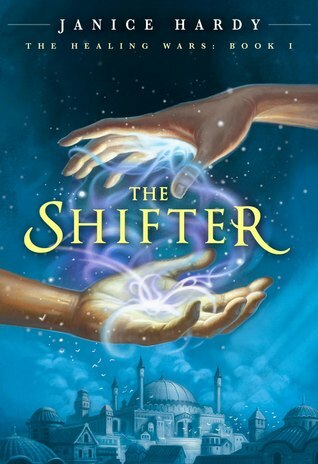 I felt like I was being told what I should be taking away from the story of The Shifter. Nonetheless, I still managed to find enjoyment in this book and maybe that's all that matters.